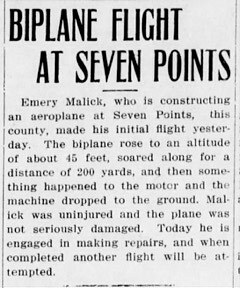 The first aviator to fly in Snyder County was Emory C. Malick. The aeroplane was a Curtiss bi-plane powered by a Curtiss OX2 Engine driving two contra rotating propellers. 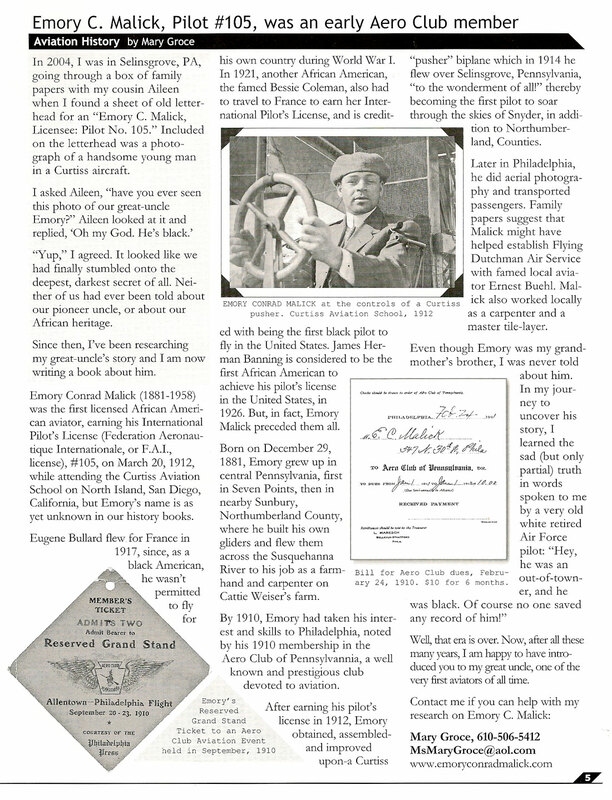 The events of his flight are in the news papers of that time, but the background of his ambition and interest in flying are in the letters he had written to aircraft and engine manufactors, also the few vintage areo magazines and pamphlets that were in his estate and have been presented to the Snyder County Historical Society by his nephew, Warren F. Groce, of Selinsgrove, Pa.
Emory Malick, the first African-American pilot, wasn't known to historians until recently. Was first African-American pilot born here? Please contact me if you can help with my research on Emory Conrad Malick and the history of aviation in the Delaware Valley, Central Pennsylvania, and San Diego. Thank you! Web design and development by Suzannah Sulek.